Random Touch - "A True Conductor Wears a Man"
Random Touch is the Illinois based trio of Christopher Brown on drums, percussion and electronics, James Day on synths and Scott Hamill on guitar, banjo, slide guitar and mandolin. 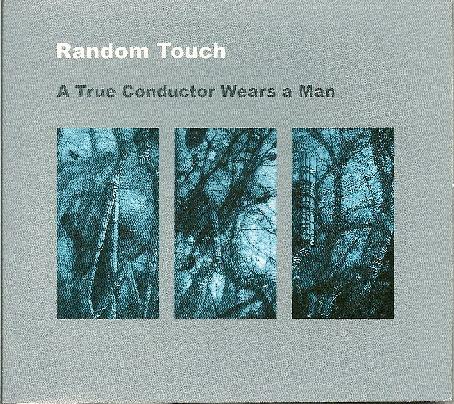 A True Conductor Wears a Man is their eighth release. The CD opens with a jazzy glom of percussion, keyboards and looped guitar. The drumming gives the music a traditional jazz feel, while the guitar and keys are in swirling avant-space. This brief intro leads into "The Giant Took a Liking to Jack" (lots of interesting track titles on this album). Like the intro, there's a banquet of elements thrown into a carefully concocted stew. Voices, percussion, electronics, guitar… it's like free-improv, with a free-wheeling feel, yet you can tell it's composed. Loose, freeform, yet controlled. I love the way these guys bring multiple contrasting musical styles and sounds together. Jazz is a strong foundation, but also classical and rock. But anything that hints of the traditional is always offset and supported by myriad other ingredients. Like the concert piano, jazz drumming and searing guitar on "A Slow March Becomes a Flight". I like the playful spacey ambience on "Skipping", which becomes increasingly busy and even gets an oddball sort of groove going. "Shelter" is similar, starting with very sparse spacey guitar, keyboard and percussion bits, slowing building up to create a lysergic sort of ambient space symphony. It's orchestral but nicely tripped out. Scott Hamill goes Hendrix on "Getting Ready", propelled by steady rock drumming, but augmented by ambient soundscapes. And I enjoyed the dark ambience and spacey soundscape dueling with bits of rock and jazz on "Naked Feet in the Dark". There are 14 tracks on the CD but they're strung together such that it all flows more or less seamlessly from beginning to end. The music is beautifully recorded and has impeccable sound quality, making this a thoroughly enjoyable headphones listen. Much to their credit, you really can't classify Random Touch. They bring the musical and sound-art worlds together in spellbinding ways. And if you read my review of their last album in AI #37 you'll know that visuals are an important element as well. But even without explicit visuals, the audio alone is a highly image inducing experience. If you are at all intrigued, these guys make it very easy to try them out as their CDs are available for a mere $8.